A key focus of the Burnhamthorpe SNAP Action Plan is to increase resilience in the residential homes across the neighbourhood. This includes indoor and outdoor home retrofits related to energy and water, including rain water management. 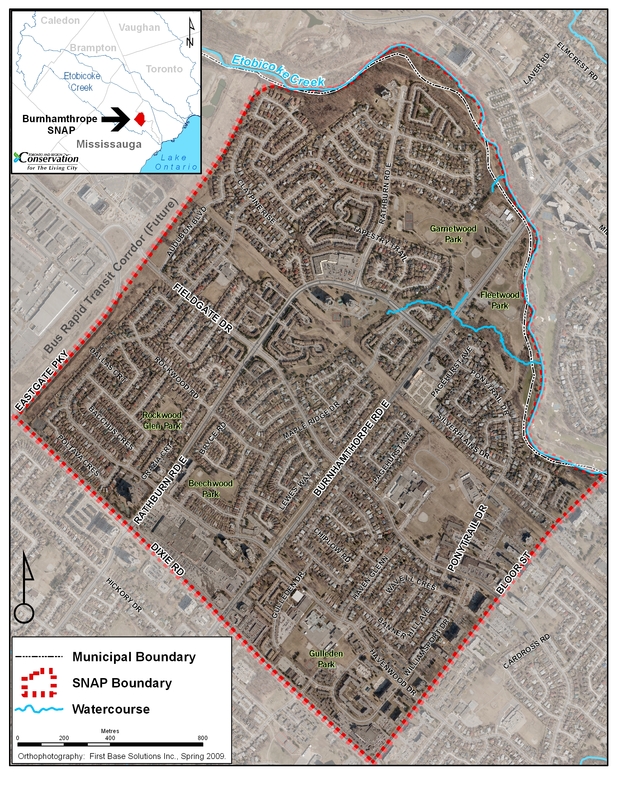 In 2016, the SNAP team worked closely with the City of Mississauga and Region of Peel to research, design and pilot a neighbourhood-scale program to increase participation in stormwater management actions, a major interest of local residents. The pilot supported the Region of Peel’s downspout disconnection rebate program and the City of Mississauga’s newly implemented stormwater charge. Home Consultations: a program advisor visited homes to help residents understand how to better manage stormwater on their property. Workshops: a series of workshops were held to educate residents on how to disconnect their downspouts. Further to this, lot-level LID concepts were introduced to inspire and intrigue homeowners to incite their curiosity and schedule a home consultation. Information Station: Weekly information stations were set up at the library and other local establishments to promote and gain exposure to SNAP generally, and promote the residential program offer. Demonstration projects: Partnership projects with EcoSource, including Depave Paradise, were promoted to provide education, understanding and appreciation of lot-level LID and “stormwater-friendly” landscaping. These continue to provide an inspiring attractive example which residents can replicate at their home.